You'll notice that we're now doing Toon Thursday. Besides being more alliterative, now the cartoons won't interfere with the already-existing Poetry Friday! For last week's cartoon, click here. I like this. We have 'Toon Thursday, MotherReader has Thoughtful Thursday. Wonder why nobody's picking Monday for anything? That comic is so inaccurate. I mean, the stacks of manuscripts are actually neat, and the manuscripts have actually been opened. 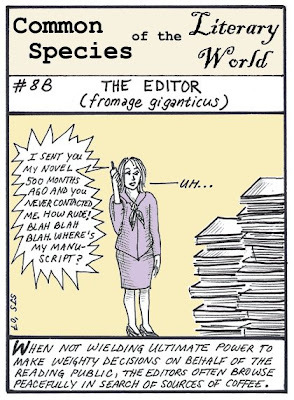 And then there's the idea that an editor would actually SEE the slush pile. I mean, really, do editors read manuscripts from the slush pile? I so don't think so. Callooh! Callay! Behold the Day!